GUC Beautiful Crystal Hurricane Lamp/ Candle Holder. 7.5" Tall 5" Wide At Top. As you can see in the pictures there is a tapered candle spot at the bottom of the vase. Cut glass for the starburst design and raised, square cut, diamond shaped ring around the base. I took pictures in various lighting and with a candle in it to show it better. St. George Crystal Lead Crystal Vase / Hurricane Candle Holder/ folower box 3-1. Shipped with USPS Priority Mail. 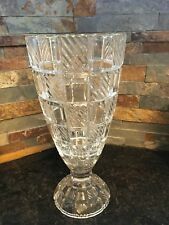 Clear Crystal Hurricane Vase Candle Holder 2 Votives 4-5/8" Tall USA NEW! 2 Clear 24% Lead Crystal Hurricane Vase Candle Holder Votive. Made in USA. New- Unused. This little vase I don't think has ever been used, it still has the St George sticker on it. A beautiful piece and versatile, it can be used as a vase or Hurricane candle holder. Still has St George sticker. 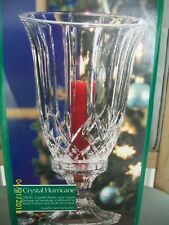 Towle Lead Crystal Vase / Hurricane Candle Holder. Two pieces which can be used together as a vase or large hurricane candle holder or separately. 11.5” X 5.5”. 2 Piece 12" Crystal Hurricane Candle Vase. Condition is New. IN EXCELLENT CONDITION WITH ORIGINAL BOX. It is in excellent condition without any cracks, scratches, or nicks. Made by the Source Perrier Collection 2003. Beautiful quality cut crystal bowl, hurricane lamp, vase, ice bucket, fruit bowl.its distinctive shape allows for so many uses. Original sticker on bottom of crystal. Fifth Avenue Crystal Hurrican Candle Holder / Vase. Block Lead Crystal Olympic Hurricane Candle/Vase 7"
Block Crystal Hurricane Candle/Vase 7”. Olympic Pattern. 24% Full Lead Crystal. This open hurricane flower vase is made by Rogaska and has etched flower vines on the upper outside portion and has a diamond pattern on the bottom portion. Beautiful LeadCrystal Vase or Candle Hurricane. The piece weighs nearly 3 lbs. Very unique! What a beauty, sparkling lead crystal unique hurricane candle holder, it's two pieces and the larger one stacks on top. Imagine the candle flickering in this sparkly glass. Makes a wonderful gift. The crystal has been kept in a china cabinet, so it is in very good condition. Candle is not included. BLOCK OLYMPIC 7" HURRICANE. New item from the late 1990’s, original gold oval sticker still attached. One piece 24% full lead crystal. Still in original box, item is in excellent condition !!! Beautiful, contemporary and heavy! One of these has a tiny smooth chip along the rim. It is shown on the last picture. Barely noticeable. I’m offering free shipping from a smoke free home. Thanks for looking! Block Tulip Garden Clear Cut Crystal Open Hurricane Vase, Poland, manufactured 1995 - 2005. This set of 2 vases can also be used as candle holders. You are buying a fifth avenue Crystal candle holder vase. Listed by CJ. Includes White 3" x 3" Candle. Tulip Garden Block 24% Lead Crystal Hurricane Vase 7" In excellent condition . Shipped with USPS Priority Mail. Hurricane Candle/Vase. Olympic Pattern. Candle not included. 24% Full Lead Crystal. Block Crystal. Block Crystal Company candle holder. It is approximately 7 inches tall and can hold a tapered candle or votive. This is 24% lead crystal. This is in great shape with no cracks or chips. On one side there is a little tiny surface scratches. Please see all pictures and ask any questions prior to bidding. Sorry no International sales or shipping at this time. Shannon 24% Lead Crystal by Godinger. This piece is a significant piece of Crystal and weighs almost 13lbs. NEW Block 24% Full Lead Crystal Tulip Garden Hurricane Vase Stickers Still On. NEW Block 24% Full Lead Crystal Tulip Garden Hurricane Vase. 7.5 Inches. Made in Poland. Stickers Still On.. Shipped with USPS Priority Mail. For your consideration I have a gorgeous Crystal Cut Glass VASE/HURRICANE CANDLE Holder from Fifth Avenue LTD Poland. This piece has the original stickers on the bottom. It is in MINT pre owned condition! 24% Lead Crystal. I have 2 for sale, box on one shows minimal shelf wear. 18 Better Homes and Gardens swirl hurricane vases/candle holders. Some have original boxes. All are in new condition. TOWLE Crystal 24% Lead Crystal Madeira Hurricane Ht. 12”. Gently used in great condition! No chips or cracks!